Nick Cutter aka Patrick Lestewka, author of The Preserve and The Coliseum, aka Craig Davidson, author of Cataract City, Sarah Court, The Fighter, and Rust and Bone. Every year Scoutmaster Dr. Tim Riggs leads a troop of scouts to an isolated island deep in the Canadian wilderness. Year-after-year has been the same, but with this excursion, The Hungry Man has followed them. Tim Riggs is a General Practitioner and lifelong bachelor living in a small, lonely Canadian village that he’s had trouble adapting to despite his long lived practice. His Scout troop is Kent, the son of the town sheriff, “forever” friends Ephraim and Max, class whipping boy, Newt, and budding psychopath, Shelley. I think John Hawkes would be a great choice for Scoutmaster Tim. The Troop would, of course, be played by a cast of unknowns. No, way too far off the grid for my liking. There is an emotion that operates on a register above sheer terror. It lives on a mindless dog whistle frequency. Its existence is itself a horrifying discovery: like scanning a shortwave radio in the dead of night and tuning in to an alien wavelength—a heavy whisper barely climbing above the static, voices muttering in a brutal language that human tongues could never speak. You can see where I'm going with this, right? The Troop contains all of these favorite scenarios. Throw in the angst of rapidly changing 14-year-olds, the loss of the thin veil of adult control, and you have all the makings of a classically honed horror novel. 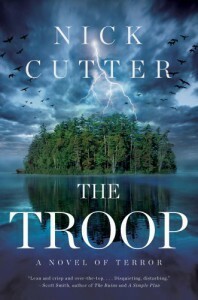 The Troop is a character driven page turner in the same vein as King and Ketchum. Backstory drives the narrative forward as Cutter builds tension from page one with the introduction of The Hungry Man, a walking biohazard starving on his feet that stuffs anything from napkins to roadkill in his mouth to quell its ceaseless rumbling. For those of you who are picking up The Troop thinking it's going to be a Craig Davidson novel, you are going to be disappointed. True, there are signature flourishes that are undeniably Davidson's—there is no author better at penning action scenes and violence as far as I'm concerned—but you're not going to have the fringe of society characters which typically populated Sarah Court, The Fighter, and Rust and Bone. What you will get instead is 400 pages of high intensity entertainment meant to be read in a single sitting.